Stand by . . . grumpy old man routine compiling . . . So, someone at Sony decided that an Angry Birds movie would be a good idea, about three years after the Angry Birds “having a moment” moment was over. There’s a trailer for it now, and at the end of the trailer, a bird pees for like 17 seconds (which is about 1/7 of my personal record, but whatever). Congratulations, IFLScientists, on knowing One Fact about nature. Tragically for you, nature knows countless facts, and among them are that birds and crocodilians can pee. And since extant dinosaurs can and do pee, extinct ones probably could as well. So, you know . . . try to show a little respect. Now, it is true that crocs (mostly) and birds (always?) release more of their nitrogenous waste as uric acid than as urea. But their bodies produce both compounds. So does yours. We mammals are just shifted waaaay more heavily toward urea than uric acid, and extant archosaurs – and many (but not all) other reptiles to boot – are shifted waaaay more heavily toward uric acid than urea. 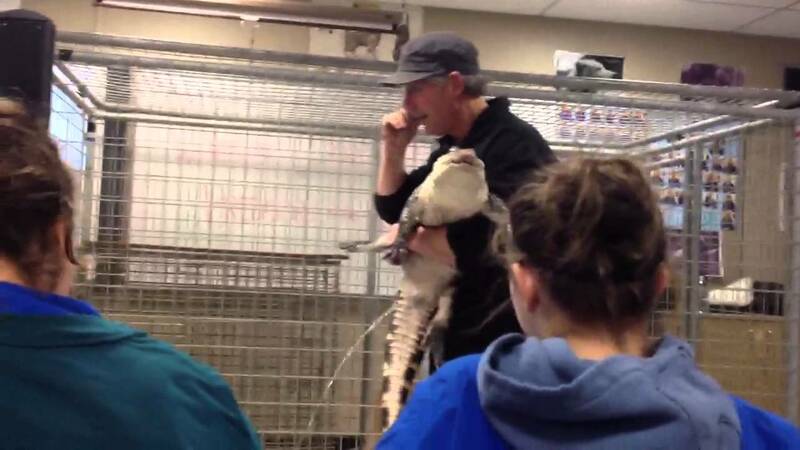 Alligators also make a crapload of ammonia, but that’s a story for another time. If you’ve never seen this, you’re just not getting to the bird poop fast enough – the urine is drying up before you notice it. Pick up the pace! Sometimes birds and crocs save up a large quantity of fluid, and then flush everything out of their cloacas and lower intestines in one shot, as shown in the photos dribbled through this post. 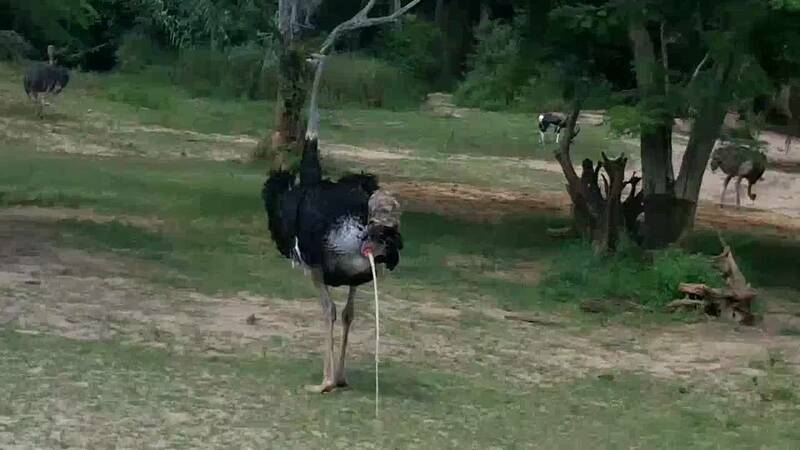 Which has led to some erroneous reports that ostriches have urinary bladders. They don’t, they just back up lots of urine into their colons. Many birds recapture some water and minerals that way, and thereby concentrate their wastes and save water – basically using the colon as a sort of second-stage kidney (Skadhauge 1976). Many thanks to Markus Bühler for permission to post his well-timed u-rhea photo. Aaaanyway, all those white urate solids tend to make bird pee more whitish than yellow, as shown in the photos. I have seen a photo of an ostrich making a good solid stream from cloaca to ground that was yellow, but that was years ago and frustratingly I haven’t been able to relocate it. Crocodilians seem to have no problem making a clear, yellowish pee-stream, as you can see in many hilarious YouTube videos of gators peeing on herpetologists and reporters, which I am putting at the bottom of this post so as not to break up the flow of the rant. I’ve helpfully highlighted the operative term, to reinforce the main point of the post. Many of these papers are freely available – get the links from the References section below. A few are paywalled – really, Elsevier? $31.50 for a half-century-old paper on chicken pee? – but I’m saving them up, and I’ll be happy to lend a hand to other scholars who want to follow this stream of inquiry. If you’re really into the physiology of birds pooling pee in their poopers, the work of Erik Skadhauge will be a gold mine. Now, to be fair, I seriously doubt that any bird has ever peed for 17 seconds. But the misinformation abroad on the net seems to be more about whether birds and other archosaurs can pee at all, rather than whether a normal amount of bird pee was exaggerated for comedic effect in the Angry Birds trailer. In conclusion, birds and crocs can pee. Go tell the world. …and the citations are McCarville and Bishop (2002) – an SVP poster about a possible sauropod pee-scour, which is knew about but didn’t mention yet because I was saving it for a post of its own – and Fernandes et al. (2004) on some very convincing trace fossils of dinosaurs peeing on sand, from the Lower Cretaceous of Brazil. In addition to being cogent and well-illustrated, the Fernandes et al. paper has the lovely attribute of being freely available, here. So, sorry, Brian, that I’d missed your post! And for everyone else, stand by for another dinosaur pee post soon. 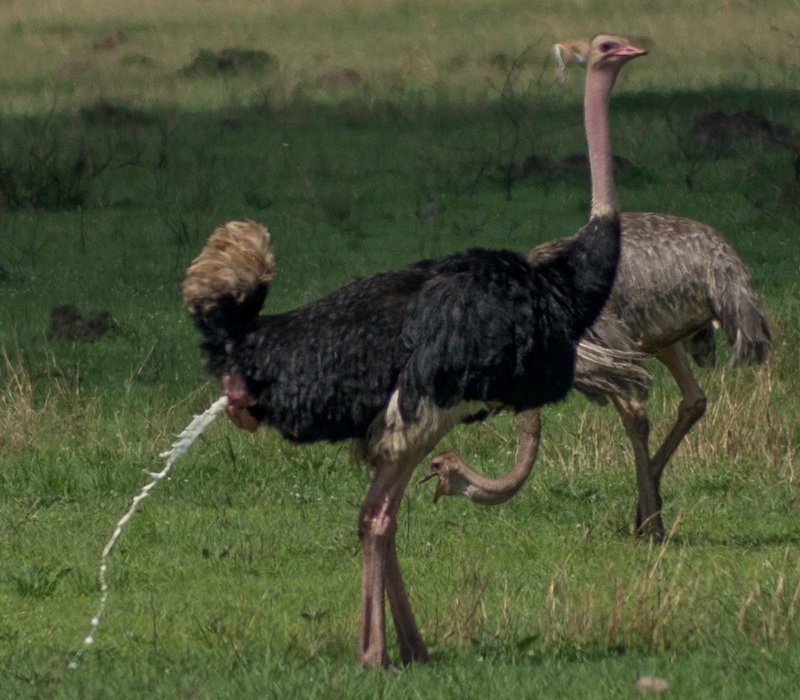 And here’s one more video of an ostrich urinating (not pooping as the video title implies). The main event starts about 45 seconds in. Duke, G.E., Degen, A.A. and Reynhout, J.K., 1995. 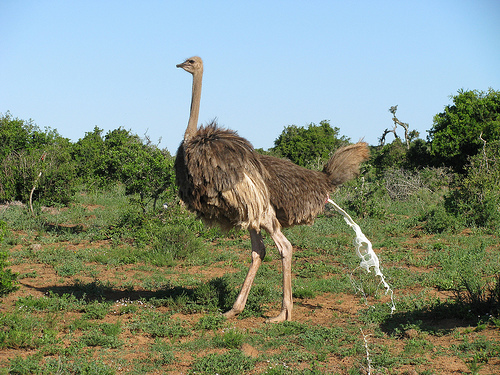 Movement of urine in the lower colon and cloaca of ostriches. Condor, 97, pp.165-173. Fernandes, M., Fernandes, L., Souto, P. 2004. Occurrence of urolites related to dinosaurs in the Lower Cretaceous of the Botucatu Formation, Paraná basin, São Paulo State, Brazil. Revista Brasileira de Paleontologia. 7(2), pp.263-268. Grigg, G.C., 1981. Plasma homeostasis and cloacal urine composition in Crocodylus porosus caught along a salinity gradient. Journal of Comparative Physiology, 144(2), pp.261-270. McCarville, K., Bishop, G. 2002. To pee or not to pee: evidence for liquid urination in sauropod dinosaurs. In: 62nd Annual Meeting of the Society of Vertebrate Paleontology, Abstract Book. Journal of Vertebrate Paleontology 22(3, Supplement), p. 85A. Myburgh, J.G., Huchzermeyer, F.W., Soley, J.T., Booyse, D.G., Groenewald, H.B., Bekker, C., Iguchi, T. and Guillette, L.J., 2012. Technique for the collection of clear urine from the Nile crocodile (Crocodylus niloticus). Journal of the South African Veterinary Association, 83(1), pp.1-7. Skadhauge, E., 1968. The cloacal storage of urine in the rooster. Comparative Biochemistry and Physiology, 24(1), pp.7-18. Skadhauge, E., 1976. 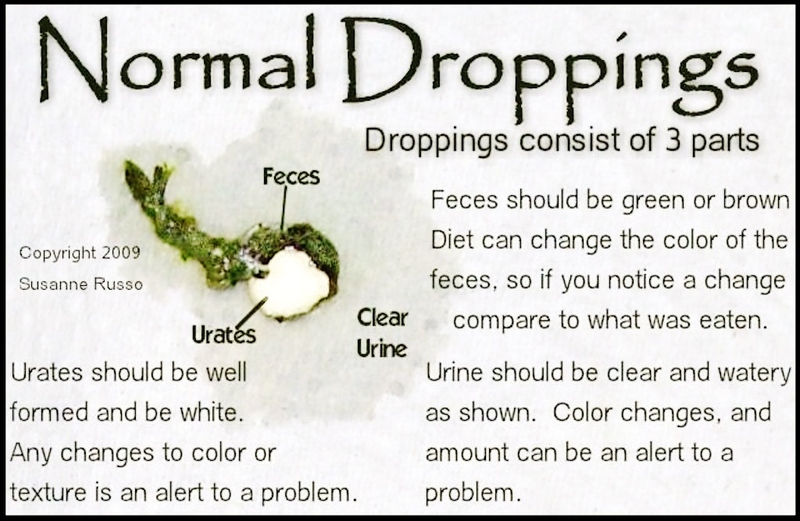 Cloacal absorption of urine in birds. Comparative Biochemistry and Physiology Part A: Physiology, 55(2), pp.93-98. This will be all too short, but I can’t let the publication of a new giant sauropod pass unremarked. Yesterday Bernardo González Riga and colleagues published a nice, detailed paper describing Notocolossus gonzalezparejasi, “Dr. 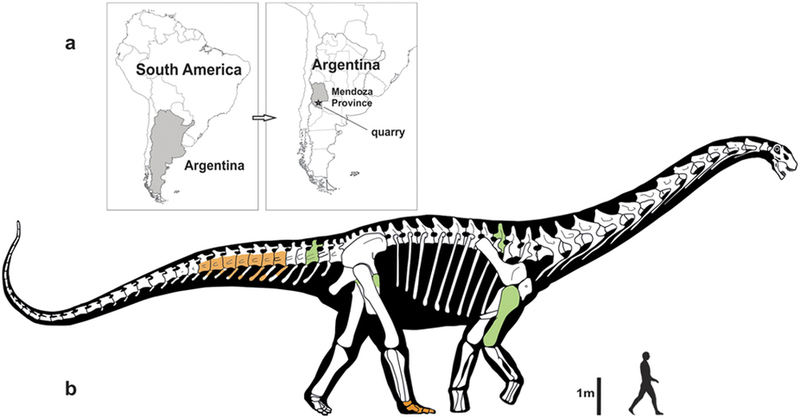 Jorge González Parejas’s southern giant”, a new titanosaur from the Late Cretaceous of Mendoza Province, Argentina (González Riga et al. 2016). The paper is open access and freely available to the world. As you can see from the skeletal recon, there’s not a ton of material known from Notocolossus, but among giant sauropods it’s actually not bad, being better represented than Argentinosaurus, Puertasaurus, Argyrosaurus, and Paralititan. In particular, one hindfoot is complete and articulated, and a good chunk of the paper and supplementary info are devoted to describing how weird it is. But let’s not kid ourselves – you’re not here for feet, unless it’s to ask how many feet long this monster was. So how big was Notocolossus, really? Well, it wasn’t the world’s largest sauropod. And to their credit, no-one on the team that described it has made any such superlative claims for the animal. Instead they describe it as, “one of the largest terrestrial vertebrates ever discovered”, and that’s perfectly accurate. Any discussions of the size of Notocolossus will be driven by one of two elements: the humerus and the anterior dorsal vertebra. The humerus is 176 cm long, which is shorter than those of Giraffatitan (213 cm), Brachiosaurus (204 cm), and Turiasaurus (179 cm), but longer than those of Paralititan (169 cm), Dreadnoughtus (160 cm), and Futalognkosaurus (156 cm). Of course we don’t have a humerus for Argentinosaurus or Puertasaurus, but based on the 250-cm femur of Argentinosaurus, the humerus was probably somewhere around 200 cm. Hold that thought. Top row: my attempt at a symmetrical Notocolossus dorsal, made by mirroring the left half of the fossil from the next row down. 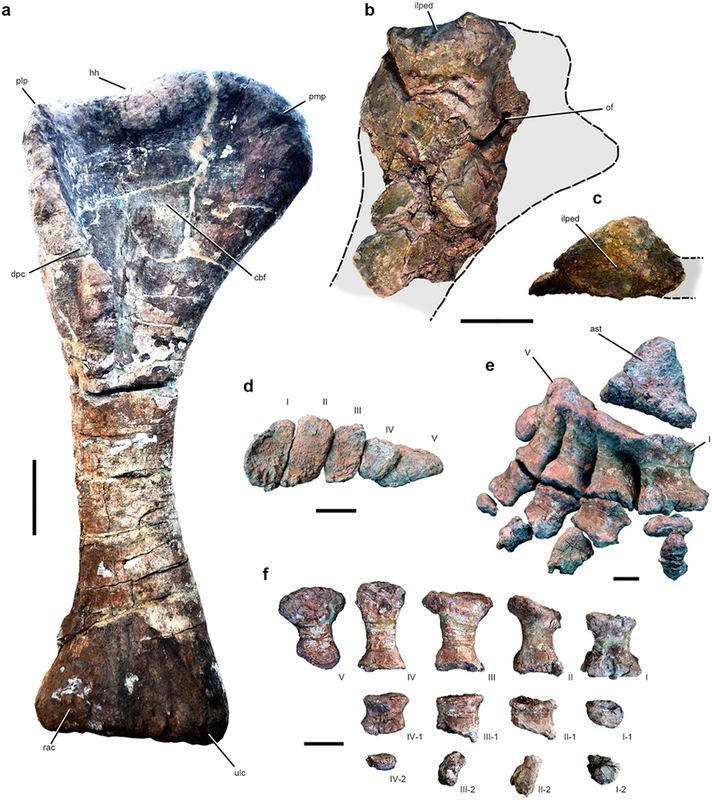 Second row: photos of the Notocolossus dorsal with missing bits outlined, from Gonzalez Riga et al (2016: fig. 2). Scale bar is 20 cm (in original). Third row: the only known dorsal vertebra of Puertasaurus, scaled to about the same size as the Notocolossus vertebra, from Novas et al. (2005: fig. 2). The anterior dorsal tells a similar story, and this is where I have to give González Riga et al. some props for publishing such detailed sets of measurements in the their supplementary information. 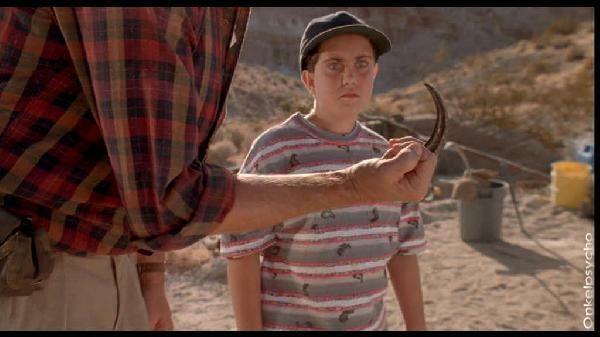 They Measured Their Damned Dinosaur. The dorsal has a preserved height of 75 cm – it’s missing the tip of the neural spine and would have been a few cm taller in life – and by measuring the one complete transverse process and doubling it, the authors estimate that when complete it would have been 150 cm wide. That is 59 inches, almost 5 feet. 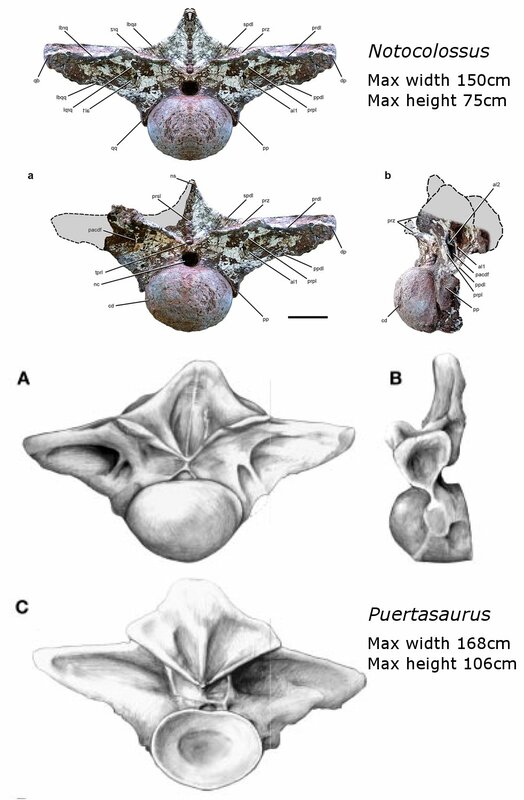 The only wider vertebra I know of is the anterior dorsal of Puertasaurus, at a staggering 168 cm wide (Novas et al. 2005). The Puertasaurus dorsal is also quite a bit taller dorsoventrally, at 106 cm, and it has a considerably larger centrum: 43 x 60 cm, compared to 34 x 43.5 cm for Notocolossus (anterior centrum diameters, height x width). 46 cm – Dreadnoughtus dorsal, MPM-PV 1156, Lacovara et al. (2014: Supplmentary Table 1) – thanks to Shahen for catching this one in the comments! (Fine print: I’m only logging each taxon once, by its largest vertebra, and I’m not counting the dorsoventrally squashed Giraffatitan cervicals which get up to 47 cm wide, and the “uncatalogued” Supersaurus dorsal is one I saw back in 2005 – it almost certainly has been catalogued in the interim.) 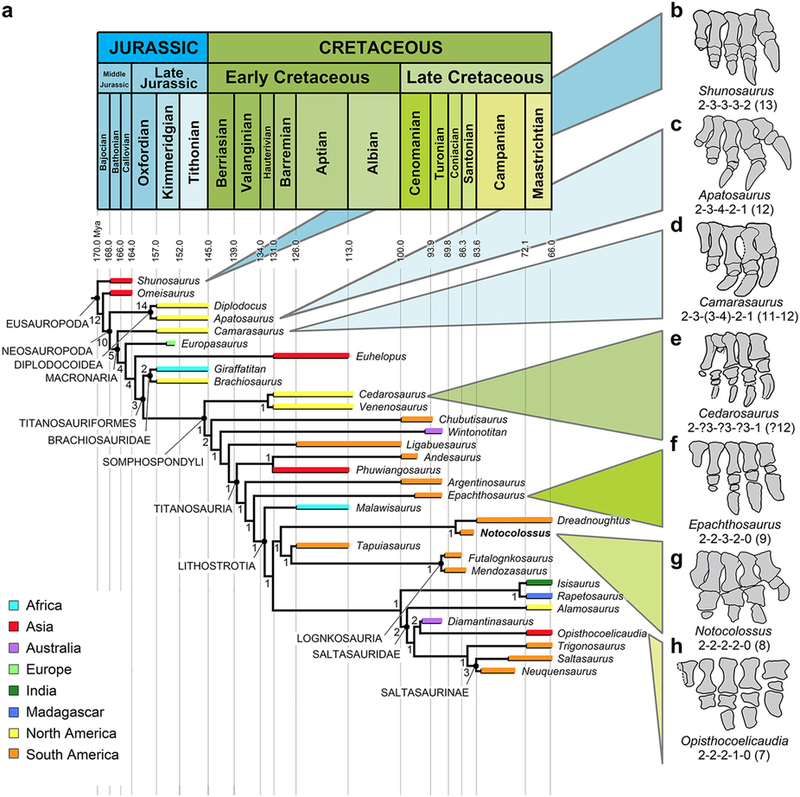 Two things impress me about this list: first, it’s not all ‘exotic’ weirdos – look at the giant Oklahoma Apatosaurus hanging out halfway down the list. Second, Argentinosaurus and Puertasaurus pretty much destroy everyone else by a wide margin. Notocolossus doesn’t seem so impressive in this list, but it’s worth remembering that the “max” centrum diameter here is from one vertebra, which was likely not the largest in the series – then again, the same is true for Puertasaurus, Alamosaurus, and many others. The [humeral] diaphysis is elliptical in cross-section, with its long axis oriented mediolaterally, and measures 770 mm in minimum circumference. 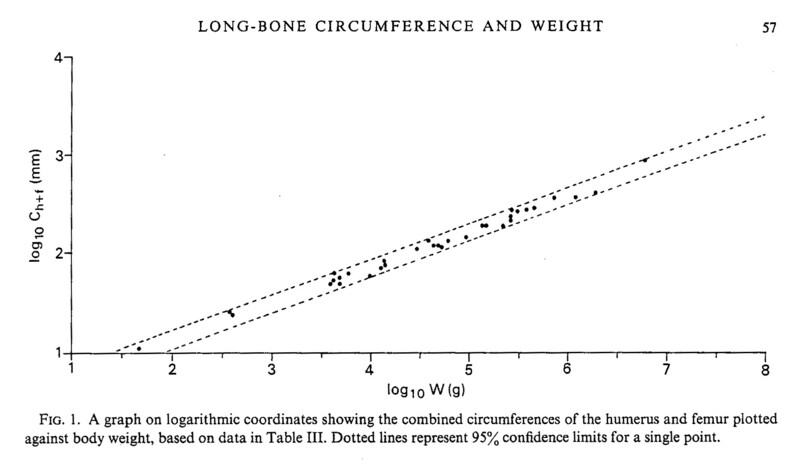 Based on that figure, the consistent relationship between humeral and femoral shaft circumference in associated titanosaurian skeletons that preserve both of these dimensions permits an estimate of the circumference of the missing femur of UNCUYO-LD 301 at 936 mm (see Supplementary Information). (Note, however, that the dataset that is the source of this estimate does not include many gigantic titanosaurs, such as Argentinosaurus, Paralititan, and Puertasaurus, since no specimens that preserve an associated humerus and femur are known for these taxa.) In turn, using a scaling equation proposed by Campione and Evans, the combined circumferences of the Notocolossus stylopodial elements generate a mean estimated body mass of ~60.4 metric tons, which exceeds the ~59.3 and ~38.1 metric ton masses estimated for the giant titanosaurs Dreadnoughtus and Futalognkosaurus, respectively, using the same equation (see Supplementary Information). It is important to note, however, that subtracting the mean percent prediction error of this equation (25.6% of calculated mass) yields a substantially lower estimate of ~44.9 metric tons for UNCUYO-LD 301. Furthermore, Bates et al. recently used a volumetric method to propose a revised maximum mass of ~38.2 metric tons for Dreadnoughtus, which suggests that the Campione and Evans equation may substantially overestimate the masses of large sauropods, particularly giant titanosaurs. Unfortunately, however, the incompleteness of the Notocolossus specimens prohibits the construction of a well-supported volumetric model of this taxon, and therefore precludes the application of the Bates et al. method. The discrepancies in mass estimation produced by the Campione and Evans and Bates et al. methods indicate a need to compare the predictions of these methods across a broad range of terrestrial tetrapod taxa. Nevertheless, even if the body mass of the Notocolossus holotype was closer to 40 than 60 metric tons, this, coupled with the linear dimensions of its skeletal elements, would still suggest that it represents one of the largest land animals yet discovered. So, nice work all around. As always, I hope we get more of this critter someday, but until then, González Riga et al. (2016) have done a bang-up job describing the specimens they have. Both the paper and the supplementary information will reward a thorough read-through, and they’re free, so go have fun. Calvo, J. O., Porfiri, J. D., González Riga, B. J., and Kellner, A. W. A. 2007. Anatomy of Futalognkosaurus dukei Calvo, Porfiri, González Riga & Kellner, 2007 (Dinosauria, Titanosauridae) from the Neuquén Group (Late Cretaceous), Patagonia, Argentina. Arquivos do Museu Nacional, Rio de Janeiro, 65(4): 511-526. Fowler, D. W. and Sullivan, R. M. 2011. The first giant titanosaurian sauropod from the Upper Cretaceous of North America. Acta Palaeontologica Polonica 56 (4): 685–690. Lü J, Xu L, Jia S, Zhang X, Zhang J, Yang L, You H, Ji Q. 2009. A new gigantic sauropod dinosaur from the Cretaceous of Ruyang, Henan, China. Geological Bulletin of China 28(1): 1-10.